Balsamic roasted carrots are an easy and healthy side dish recipe to serve for dinner tonight. Experience the health benefits of this simple dish that is also perfect for Easter or family gatherings. Even picky eaters will enjoy eating them. Roasted carrots are the best way to eat cooked carrots. I have never been a fan of boiled carrots, but if you roast them, now that’s another story. The roasting process makes them sweeter and more flavorful. Did you know that carrots are the second most popular vegetable in the U. S., next to potatoes? I didn’t until recently. We all know carrots are high in vitamins, but did you know which ones? Most of us could answer Vitamin A, but they’re also high in vitamins K, C and B too. Carrots are also very high in beta-carotene, but to maximize those health benefits carrots needs to be cooked with a bit of fat. This recipe uses olive oil, which makes this dish an excellent heart-healthy side. Try serving these roasted carrots with our delicious Salisbury steak with onion gravy for supper tonight your wallet and your heart will thank you. Hungry for more veggie sides? These other recipes are delicious! 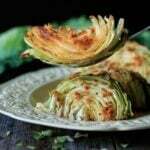 Roasted Cabbage Wedges with Lemon Garlic Butter: a quick, low carb side dish that everyone will love. How to Make Delicious Mushy Peas: no need to buy the canned version when you can make your own. 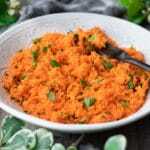 French Grated Carrot Salad: freshly grated carrots are mixed with a tangy dressing. Yum! Did you make these balsamic roasted carrots? Please leave a star rating below the recipe to share how you enjoyed it. Preheat the oven to 400 F, then line a rimmed cookie sheet with foil. Rinse, peel, and slice the carrots lengthwise. Peel 8 medium garlic cloves. Place on top of a cutting board, and crush each clove with the side of a knife blade. Rinse the lemon, and slice it lengthwise, then quarter each half. Place the carrots, garlic, and lemons in a large bowl or rectangular cake pan. Toss with the olive oil and white balsamic vinegar. Dump the carrots and garlic onto the lined cookie tray. Squeeze some fresh lemon juice onto the carrots. Sprinkle with salt, black pepper and thyme. Place the remaining lemon wedges on the tray and cover with foil. Cook for 20 minutes, then flip the carrots over with a fork. Cover again with foil and bake another 20 minutes. Remove the roasted garlic cloves and lemon wedges from the cookie tray. Cook uncovered for 5 to 8 minutes. Break up the garlic cloves into smaller pieces. Serve scattered on top of the roasted carrots. Serve warm on a platter. Makes an excellent side dish at supper. Next Post Easter Chick Deviled Eggs + Egg Peeling Secrets!